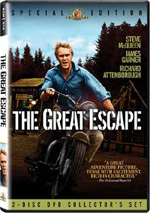 Set in a German POW Camp for enlisted American airmen, a spy is discovered to be living in one of the prison barracks after an escape attempt fails resulting in the deaths of two inmates. The prisoners at once suspect Septon, an unscrupulous inside dealer who trades almost anything with the Germans for extra privileges. After Septon is beaten up, he himself determines to find the real spy and the result is a mixture of intrigue and betrayal leading to a surprise ending. At the start of 1953’s Stalag 17, the narrator gripes that war movies always focus on extreme heroics and they never let you see the day-to-day existence. The film aims to change that with its look at Allied POWs, and it does so in an extremely satisfying manner. Stalag 17 introduces us to the inmates of the titular prison camp. It concentrates on the guys in Barracks 4 and we see the issues that concern them. Most of these revolve around basic issues of comfort and survival, but a more serious problem emerges when the men suspect a spy resides in their midst. These ideas grow after two prisoners attempt to escape but barely make it beyond the fences. It seems likely that someone tipped off the Germans, and most eyes turn toward mercenary Sefton (William Holden). He runs his own private black market and seems to enjoy privileges not granted to the others. Sefton also has few friends, so that makes him an even easier target. All of this climaxes with the arrival of saboteur Dunbar (Don Taylor). He managed to sabotage a German munitions train, and the Nazis dearly want to punish him for that. The guys in Barracks 4 need to get him out of the camp before the Krauts take him away, but they need to get around the spy. The movie follows these events as well as the eventually unmasking of the traitor. Stalag 17 is a lot like Hogan’s Heroes except for it’s good. The movie doesn’t go for the broad, goofy laughs of that sitcom. That doesn’t make it a somber, dry experience, though. It mixes light moments with serious ones in a believable manner. The flick doesn’t wallow in misery, but it also makes sure that we always remember where it takes place and what’s at stake. With a huge cast in place, it becomes difficult to explore all those characters. Stalag doesn’t bother, as it concentrates on just a few. And appropriately so, as a wider focus would have diffused its impact. Of course, star Holden gets most of the attention, and that makes sense since he plays such a pivotal role. The standout performances come from goofball pals Shapiro (Harvey Lembeck) and Animal (Robert Strauss). They essentially exist as comic relief, but they still integrate smoothly. They give the flick a human face and offer some of its more entertaining moments. Stalag works because of its diversity. It’s not a film you can easily classify. As I mentioned earlier, it includes more than a few comedic moments, but I wouldn’t call it a comedy. It also doesn’t fit into the traditional “war movie” category since it lacks much combat or other elements of that sort. It doesn’t feel like a straight drama either. Instead, Stalag 17 just seems real. Sure, it sanitizes matters and will never pass for a documentary, but it refuses to fall into neat categories. It consistently entertains and works as a very effective experience. 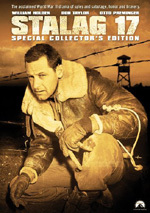 Stalag 17 appears in an aspect ratio of 1.33:1 on this single-sided, double-layered DVD; due to those dimensions, the image has not been enhanced for 16X9 televisions. Despite the film’s age, the picture consistently looked terrific. Sharpness was very good. A little edge enhancement caused some light softness in a few shots, but the vast majority of the movie presented solid delineation. The movie lacked any signs of jagged edges or shimmering, and source flaws appeared virtually absent. A bit of grain was inherent to the original film, and no specks, marks or other issues caused distractions in this clean transfer. The black and white image demonstrated good tones. Blacks came across as deep and rich throughout the movie, and it offered fine contrast. Shadow detail looked appropriately heavy but never came across as excessively heavy. I found little about which to complain during this strong visual experience. The monaural soundtrack of Stalag 17 also worked well given the age of the material. Speech seemed reasonably accurate and distinct, with no issues related to intelligibility or edginess. Music came across as fairly bright and lively. Effects also displayed generally accurate tones. Those elements sounded clean and had a bit of punch at times. In the end, this was a very satisfying track for a movie from 1953. This Special Edition release of Stalag 17 packs a number of extras. We start with an audio commentary from actors Richard Erdman (“Hoffy”) and Gil Stratton (“Cookie”) and co-playwright Donald Bevan. All three sit together for this running, screen-specific discussion. That may sound promising, but the end result is a dud. The men discuss war experiences, inspirations for parts of the movie, the other actors, and general production notes. The occasional interesting tidbit emerges, such as when they chat about how unpleasant Otto Preminger could be. However, these nuggets are exceedingly rare. The vast majority of the movie passes with no information whatsoever, and even when the men talk, they usually provide banal comments. This is a genuinely useless commentary. A documentary called Stalag 17: From Reality to Screen runs 21 minutes and 58 seconds. It features movie clips, archival materials, and interviews. We hear from Erdman, Stratton, Bevan, biographer Bob Thomas, biographer Bob Sikov, and filmmaker Nicholas Meyer. The show looks at the film’s origins as a play and its movement to the screen, director Billy Wilder’s involvement, the cast, sets and locations, filming and Wilder’s methods, and the movie’s reception. In this show’s 22 minutes, we learn much more about Stalag then we did in the 120-minute commentary. The piece moves briskly and hits on all the appropriate subjects. It doesn’t dig into them with tremendous depth, but it offers more than enough details to be informative and useful. Next comes a documentary entitled The Real Heroes of Stalag XVII B. In this 24-minute and 46-second piece, we find notes from Bevan, military advisor Captain Dale Dye, military historian/author Phillip Kaplan, and veterans Edward McKenzie and Ned Handy. As one might expect, the show covers facts about the real Stalag 17 and the experiences of its inmates. The piece includes many interesting stories about the site, and we learn a lot about what it was like to reside there. This works out to be a solid program. A simple 10 image Photo Gallery presents a few shots from the set and the premiere. The DVD includes some ads. We get clips for The John Wayne Collection and Titanic. These appear in the disc’s Previews area and also start the DVD. The disc fails to include a trailer for Stalag. At the time of its release, Stalag 17 was something unusual, and it still holds up very well. The movie defies classification as any particular drama and it provides a lively, intriguing view of POW life. The DVD presents excellent visuals and good sound. Despite a terrible audio commentary, the extras rebound with two informative documentaries. This is a nice release for a fine film.